Ice-skaters at San Francisco’s Union Square. Taking a spin around the Holiday Ice Rink in Union Square is a San Francisco tradition. This year, the rink opened on Nov. 1., and ccording to its official website, there are several special events planned, including Drag Queens on Ice on Dec. 7 and Flashback Fridays on Dec. 8 and Jan. 12. 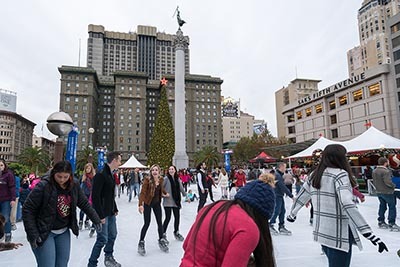 Hailed as one of the “Best Ice Skating Rinks in the U.S.” by the “Today” show, the Holiday Ice Rink in Union Square is open until Jan. 15. Check out the rink’s official website for ticket information. From now until Jan. 7, head over to the SHN Orpheum Theater in San Francisco to enjoy the hit Broadway musical based on the animated classic, “Disney’s Aladdin” — fun for the whole family! You can transport yourself to London this winter at The Great Dickens Christmas Fair at the Cow Palace until Dec. 17, where you will experience the entertainment, food, and drink of another time. This holiday adventure is a party, with hundreds of costumed players and dozens of gift shops. The fair has been a city tradition since 1970. Visit the website for ticket information. Every year, the lobby of the Fairmont San Francisco transforms into a two-story, life-sized Gingerbread House. This edible house stands more than 25 feet high and features more than 10,250 gingerbread bricks. Check out its website for more information about this holiday treat. The holiday classic tale of the Sugar Plum Fairy, the Nutcracker, and the Mouse King returns to the San Francisco Ballet from Dec. 13-30. For information about the holiday story that has been delighting audiences since 1944, visit the San Francisco Ballet website. For the last six years, the 4,100-square-foot Little Ice Rink has brought the fun to the South Shore Center in Alameda. This year, the rink is open until Jan. 15 to skaters of all ages and skill levels. Visit the official website for more information. On Dec. 1, head over to Jack London Square for the annual tree-lighting ceremony; holiday music and an evening of festivities are in store at this free event. Check out the Jack London Square website for additional details. This holiday celebration in downtown Lafayette on Dec. 1 is free, fun, and family-friendly. Festivities begin at 4 p.m. and include live music, holiday treats, a sing-along, Santa, a parade, and a tree-lighting cermony. Visit the Lafayette Chamber of Commerce website for more information. Pleasanton’s Hometown Holiday Celebration happens on Dec. 2, starting with a holiday parade that features floats, marching bands, community groups, and more. Then, gather at the museum for a tree-lighting ceremony. Visit the website for more details. Throughout December, the Oakland Zoo features ZooLights. Ride the lit gondolas, experience the light shows, stroll down the candy-cane lane, ride the Outback Express train, and rock around the Christmas tree. Santa is slated to appear on some evenings. Check out the official website for more information about tickets and dates. Until Jan. 7, experience Napa’s only outdoor ice-skating rink, located inside the grounds of the Napa Valley Expo (3rd Street between Soscol Avenue and Silverado Trail). Open to all ages, the rink features 6,300 square feet of real ice and also offers parties and special events. Check out the website for more information. Show your love for Sonoma County farmers and producers. Hosted by Sonoma County Farm Trails, celebrate the holiday season until Jan. 1 with farm tours, workshops, homemade gifts, and tastings. Locations vary, so check the official website for more information and to register. Vintage tractors, antique trucks, and classic cars — it’s the 22nd annual holiday celebration in Calistoga on Dec. 2. The parade begins on Stevenson Street, and Santa will stop by as well. Head over to the Visit Calistoga website for more info about this free event. IlluminOdyssey is described as a “winter light experience for kids.” Until Jan. 7, visit CuriOdyssey at Coyote Point in San Mateo for this kid-friendly, glowing art exhibit. Head to the official website for additional details. The annual holiday tradition known as Christmas in the Park (CITP) in downtown San Jose kicked off on Nov. 24 in Plaza de Cesar Chavez with a tree-lighting ceremony and will run through Dec. 31. CITP dates back to the 1950s and includes about 500 decorated Christmas trees and more than 40 animated displays on the two-acre park. Over 600,000 people visited CITP last year! Check out its website to learn more about this popular holiday event, which is also a nonprofit organization. On Dec. 2, head to downtown Redwood City (at the Courthouse Square) for a holiday party. Expect a parade, musical entertainment, Santa, snow, and a tree-lighting ceremony at this free event. For more information, visit the Hometown Holidays website. Two mountains, 42 lifts, 270 trails, 6,000-plus acres … that’s Squaw Valley and Alpine Meadows. According to its website, Squaw Valley is known as one of North America’s most renowned ski resorts, while Alpine Meadows is more of a local favorite. And from parties to a film series, there are several special events scheduled in the immediate area during the winter season — check this webpage for more information. Named a premier family destination by Travel + Leisure, Northstar offers an array of family-friendly activities. From an elite ski school to yoga to shopping opportunities to fine dining, the Northstar resort presents a true luxury experience. The mountain offers more than 3,000 skiable acres with over 100 trails, and there is a 9,000- square-foot ice-skating rink and a bungee experience. Check out the website to read more about the events and activities they have planned this winter. Ready to hit the slopes? Opening day at Heavenly was Nov. 17. Heavenly overlooks Lake Tahoe and features 34 miles of open, groomed cruisers and 1,600-foot plunges in the black-diamond canyons. Whether it’s shopping, spas, breweries, casinos, nightclubs, or after-ski parties, Heavenly and South Lake Tahoe offer a wide variety of activities beyond the slopes. And in addition to skiing and snowboarding, you can take a gondola ride, slide down the tubing hill, or skate in the open-air rink. There is so much to do, all winter long. Mt. Rose is Tahoe’s highest base resort at 8,260 feet. Here you will find 60-plus trails on more than 1,200 acres. Mt. Rose is the region’s closest winter resort to Reno and is 10 minutes from Lake Tahoe. The private and scenic Winters Creek Lodge is perfect for weddings and events. Check out the Mt. Rose calendar of events to see what’s going on throughout the winter.